There can be few hospital sights as distressing as the tiny, helpless scraps of humanity, bristling with tape, tubes and wires, who spend their first few days or weeks of life in the premature baby unit. Materials scientist John Rogers at Northwestern University in the US has a plan to get rid of all that cumbersome health-monitoring hardware. He is incorporating all the necessary sensors into soft, flexible, wireless electronic patches that stick to the skin. More comfortable for the baby, more convenient for carers, and a barrier removed in the bonding of the baby and its parents. Minute electronic circuits can monitor your health by sampling your sweat. ‘We have trials on babies to replace all that clumsy hardware with a pair of skin-like devices, one on the chest and one of the foot, to replace all the vital signs monitoring,’ Rogers says. ‘For some applications we’re getting quite close to producing measurements that matches up with the fidelity of clinical gold standards. Not that it is just specialised clinical settings that Rogers is targeting for wearable sensors. ‘Our vision is the average person will have one of these,’ he says. One avenue Rogers and a growing cohort of other researchers are investigating is wearable, stick-on sweat-sampling patches, non-invasively tapping a biomarker-rich readout of your health in real time. And at the heart of these devices – in fact, at the periphery as well – is chemistry. From the soft and flexible biocompatible shell, to the lap-on-a-chip style microfluidics that handle minute samples of biofluid, to the biochemical sensors that monitor the biomarkers it contains, and the flexible electronics that wirelessly beam the data to your smartphone: ‘Chemistry is at the centre of this whole thing,’ says Jason Heikenfeld, who leads the Novel Devices Lab at the University of Cincinnati in the US. A physical chemist by training, it was a postdoctoral stint in the mid-1990s in the laboratories of MIT’s George Whitesides that put Rogers on his current career trajectory to wearable biosensing technologies – albeit indirectly. ‘We were developing basic chemical approaches toward patterning and microfabrication, for flexible polymer-based electronic devices – mainly flexible displays,’ Rogers recalls. After a few years working at Bell Laboratories, Rogers moved back into academia in 2003 – and not long after, gave a talk on his flexible electronic devices at the electrical engineering department of University of Pennsylvania. ‘Some folks came up after the talk to ask if we could use the same technology to map electrical activity in the brain,’ Rogers says. ‘That was the first time it occurred to me these same platforms might be useful in the context of clinical medicine, physiology and so on. ‘For me and my students, the idea of developing new materials and chemistries for devices that could have some kind of beneficial impact on human health was a lot more satisfying than working on a new display gadget,’ he explains. 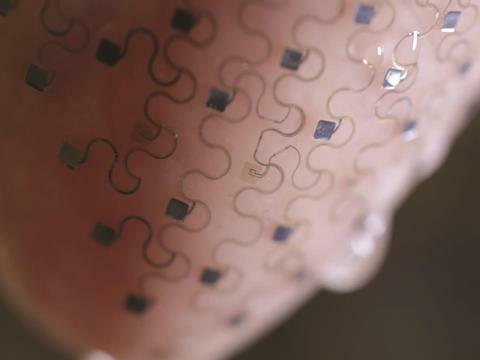 The team began by developing flexible wireless sensors capable of measuring physical parameters such as the electrical activity in the brain, heart and muscles. Key to Rogers’ work has been the development of skin-patch-based devices that, as closely as possible, match the physical properties of skin – both for wearer comfort, and because it allows more intimate, accurate measurement of the health parameters. Various polymer families have been deployed, in soft, flexible, ultra-thin-film form, as the platform on which smart skin patches have been built. Special formulations of each polymer, tailored to the application, are critical for device success. ‘With conventional off-the-shelf materials, it’s very challenging,’ Heikenfeld says. Some of the more promising are based on silicone elastomers, such as polydimethylsiloxane (PDMS). Rather than a carbon backbone, these materials are made from alternating silicon and oxygen atoms, which offers an advantage for this type of application. Whereas carbon–carbon bonds are fairly short and rigid, silicon–oxygen bonds are still strong, but are longer and more flexible, giving the backbone of these polymers an inherent stretchiness. That flexibility can be further tailored by adjusting the extent of polymer crosslinking and the incorporation of fillers. PDMS is also gas permeable, making it much more comfortable to wear against the skin. Onto this polymer substrate, the electronic circuitry and sensors are placed – which must themselves flex in harmony with the polymer backbone. One method Rogers has used is to form conventional conductive materials such as silicon or gallium arsenide into thin, meandering ‘serpentine nanoribbons’, which stretch like a two-dimensional version of the coiled flex used to connect a telephone handset to its base.1 Small electrodes incorporated into this circuitry can record electrical activity within the body, for example. This information can be wirelessly beamed out to a receiver by incorporating RF coils or even Bluetooth chips into the patch. Alternative conductive circuitry options tested so far include stretchy ultra-thin ‘foils’ made of metals, conductive polymers, and even metal-doped strips of graphene. Takao Someya at the University of Tokyo, who has developed large-area sensors based on printable, conductive organic materials, is working on indirect ways to monitor body biochemistry. ‘The most important thing for a sensor is reliability and reproducibility – and sweat contains a lot of dirty chemicals that can degrade sensors quite quickly,’ he says. 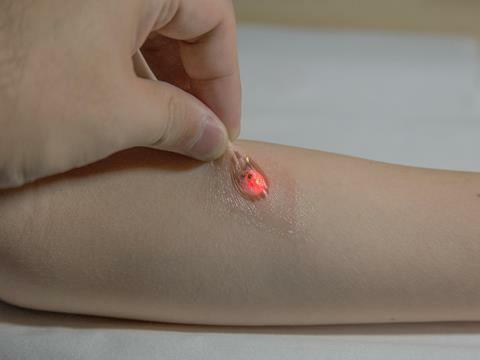 Despite being a stick-on patch just 3µm thick, Someya’s device incorporated organic light-emitting dioides and organic photodetectors capable of monitoring blood oxygen levels.2 It shines light on the skin and detects the wavelengths of light that are reflected back to measure the proportion of haemoglobin in the blood that is loaded with oxygen. ‘We detect refraction of light but collect chemical information,’ he says. The team is currently assessing other biomolecules that could be measured this way. But other researchers are prepared to get dirty and sample the biofluids directly. ‘What we’ve attempted to do is develop these skin-like devices that support the electronics, but also have the capacity to manipulate, capture, store and do chemical analysis of biofluids,’ Rogers says. Using materials that mimic skin make the devices more comfortable, and the measurments more accurate. The starting point was that the sampling was to be non-invasive, which ruled out blood. Saliva turned out to contain too much contamination to be useful. ‘Tears are interesting but you don’t want to stick too much electronics and microfluidics onto the eyeball.’ That left sweat biosensing – a fluid the nascent wearable chemistry community seems to have converged on. A flurry of papers published in the last 12 months illustrates the promise, as well as the challenges, of sweat biosensing. Sweat is relatively simple to sample using a stick-on patch. It is a complex fluid containing many useful biomarkers in concentrations that vary with physiological relevance. These include small molecules and ions such as glucose, lactate, sodium, potassium, chloride, and larger analytes such as hormones and proteins, whose sweat concentration correlates at known ratios with their concentration in the bloodstream. Among the first out of the blocks was Dae-Hyeong Kim, a former member of the Rogers lab who now runs the Translational Flextronics lab at Seoul National University in South Korea. Kim developed an experimental, wearable electronic patch for diabetes control.3 Not only does the patch sample sweat to get a patient’s glucose reading, but in tests with diabetic mice the patch delivered a shot of the drug metformin to reduce glucose levels when the sensor detects a glucose spike. Sweat sampling happens on one side Kim’s device. The sweat is delivered to a chamber containing the enzyme glucose oxidase. This is selective for glucose even in the presence of other sweat metabolites such as lactate and ascorbic acid; it catalyses the conversion of glucose into hydrogen peroxide. A gold-doped graphene electrode senses the electrochemical changes as hydrogen peroxide production rises and falls. Temperature and pH can potentially skew the sensor’s output, so sensors for these parameters are also incorporated into the flexible patch to correct the glucose reading. The other side of the device handles drug delivery when glucose levels exceed a threshold value. The glucose-lowering drug metformin is loaded into an array of microneedles, which are themselves embedded in a phase-changing material, tridecanoic acid, that melts above 41°C. 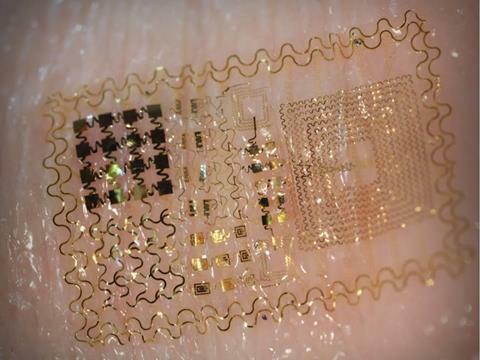 A gold–graphene heater mesh liquefies this material, exposing the microneedles to the skin. In the mice, the device successfully lowered the animals’ blood glucose levels. ‘Our system is comfortable, painless, and stress-free,’ says Kim. The team is currently working on improving the precision of the device, both on the glucose-sensing side and in the dose of drug administered on the delivery side. Blood is messy stuff that can gum up many a sensor. But not the aptamer-based sensor platform developed by a team led by Kevin Plaxco at University of California Santa Barbara in the US. They have developed a 100µm diameter device that can be implanted into a vein using a needle. So far, they’ve used them to monitor in real time the concentration of drugs in the bloodstream of rats moving freely about their cage. The device, which gives a read-out every three seconds, is a dramatic improvement on the current methods of drawing blood with a needle every 10 minutes, to be sent away to a lab for analysis. ‘At the clinical level, this would vastly improve our ability to dose drugs,’ says Plaxco. ‘Think about how we do it now: “If you’re older than 12, take two”. It’s so primitive. Or “Take one pill three times a day’, regardless of how your metabolism is fluctuating. With our device, I can measure your specific pharmacokinetics.’ Hooked up to a smartphone, you could get real-time monitoring of a drug level in your blood and a ping to alert you when to take your next pill. The aptamers Plaxco uses are DNA- or RNA-based molecules that can be rationally designed to bind target molecules with high selectivity. For Plaxco, the key appeal was that aptamers offer a generic platform that can be easily adapted to sense any target molecule. Current glucose sensors, for example, use the enzyme glucose oxidase, which specifically oxidises glucose. ‘It is critically reliant on that reaction and not generalizable to other targets,’ Plaxco says. Plaxco’s key innovation was aptamers designed to undergo a very large conformational change when they bind their target molecule – producing a large change in electrochemical signal easily picked up by a neighbouring electrode. The work has impressed Heikenfeld, who is developing wearable biomarker-sensing devices. ‘Sensors are the real challenge moving forward,’ he says. ‘Instead of introducing reagents and having sample handling to worry about, these sensors you can stick right in a fluid and they start doing what they need to do. I’ve not seen anything more promising for continuous monitoring of biomolecules.’ Heikenfeld and Plaxco are already discussing potential collaborations for sweat monitoring devices. But there’s a fundamental problem to monitoring sweat. For most of the day, apart from when you run for the bus in the morning or swing by the gym on the way home in the evening, most of us don’t actually sweat very much. The components have to be thin enough to move and flex with the wearer. Heikenfeld has a possible solution for this problem, adapted from an old-school approach for collecting sweat for lab analysis. ‘People had a bright idea a couple of decades ago to put petroleum jelly on the skin surface and let the sweat push through that,’ he says. Not only does this approach funnel the sweat for collection, the sweat never touches the skin’s surface, which is a potential source of contamination. But you can’t just slap a sensor onto a film of petroleum jelly or other oily material, or you’ll gum up the sensor. Heinekfeld’s advance is to place a thin layer of polyvinyl alcohol between the oil and the sensor.4 Only at places directly above the sweat duct, where sweat has pushed through the oil, does the PVA dissolve – directly piping the sweat to the sensor for analysis. This approach cuts skin contamination and the amount of sweat required: rather than using microlitres of sweat to take a reading, the device uses nanolitres. But in the technology’s early phases, one of the first uses for sweat monitoring devices is likely to be for elite athletes, to monitor performance during training – when producing sweat generally isn’t a problem. Elite athletes already use sweat analysis to optimise performance, but the sweat must be sampled and then taken to a lab for analysis – hardly a real-time reading that could be used to give feedback throughout a training session. In early 2016, Ali Javey at the University of California Berkeley in the US reported a wearable ‘smart wristband’ that could measure various analytes in sweat during exercise.5 A flexible sensor array makes up part of the wristband, using ion-selective electrodes – which use selectively permeable membranes to allow specific ions across – to monitor key electrolytes such as potassium and sodium, and enzyme-based sensors to measure glucose and lactic acid. A conventional flexible printed circuit board processes the data and beams it via Bluetooth to a smartphone. Rogers has taken a simpler approach to athlete sweat sensing, creating a microfluidic platform to draw sweat into reservoirs that contain dyes that change colour to give a read-out of pH, glucose, chloride and lactate concentration.6 ‘The chemistry provides all the functionality, using colour change as the read out,’ Rogers says. ‘The camera built into your phone is then the wireless data acquisition system.’ And if you carry a printed calibration scale, you don’t even need the phone – you can just eyeball it, he adds.